I can’t imagine why, but some people are spending considerable time and effort in trying to knock the investigative work done by La Vanguardia's reporters. Basically the argument used is that these are merely “specular highlights”, i.e. the bright morning sun shining on the fuselage. It’s all pretty flash Popular Mechanics kind of stuff but completely misses the point of the contour detection analysis done by the Escola Universitaria Politécnica de Mataró. This study, as the name indicates, identifies contours. In other words, it locates “specular highlights” and then checks for any corresponding shadows! Any shadow produced by a highlight would be evidence of a protrusion. This, indeed, is what the university report shows. 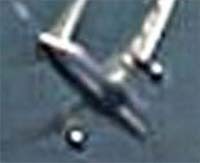 Furthermore, the shadows seen here are not produced by the wing fairings, as these are relatively flat and horizontal. 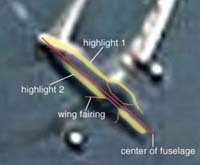 Given the angle of the plane, both wing fairings should be fully illuminated and cast no shadows on the underside. Obviously the investigative report by La Vanguardia journalists has been having its effect. The people (one man and his fax machine?) at OilEmpire.us have been having a good old time slagging off sites such as this one and Physics911.org, Let'sRoll911.org, 911Review.org, etc., for passing off fuzzy adulterated pictures. We're now called "Pod people". Looks like we're down on this black list as purportedly being in cahoots with "Spanish intelligence services". Wrong country Mark, "Sali al-Ioli and Luigi bin Liner [formerly of MI6] working the Kasbah for You". In any case, the investigative reports by La Vanguardia journalists were published in June and July of 2003, when Spain was part of the Coalition of the Bribed, I doubt that "Spanish intelligence services" would work against their own government. 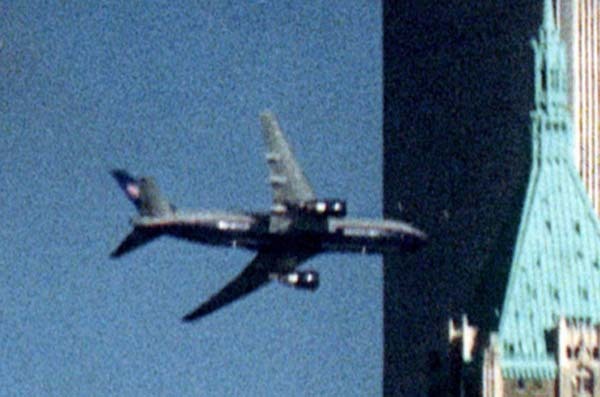 The pictures are what NBC, ABC, CNN and others broadcast on or close to the date. 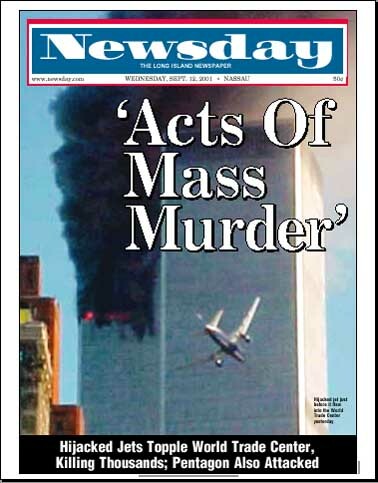 "There's no published photo evidence of these anomalies till 2 years after 9/11"
"The photos are low quality"
By the way, Carmen Taylor's photo has won several photojournalism awards: "Arkansan's Image Put Perspective On Attacks", The Times Record, Fort Smith (Sept. 8, 2002).